Did you know that roughly 60% of your body is made up of water!? What!? And did you know that most of us actually spend our days dehydrated!? Oh yes… it’s true. Most of us aren’t even drinking the bare minimum of 8 glasses a day. Me included! It’s hard for me to drink that much water! And even that is just the minimum! More exclamation points!!! Water is part of what keeps us alive. Just like the air we breathe and the sleep we need… we need water. 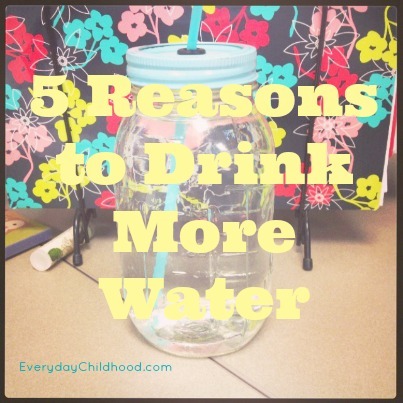 So… here are 5 reasons to motivate you (and me) to drink more of it! 1. Research has shown that dehydration causes people to become grumpy. Shake off the blues by drinking more water and staying hydrated. A happy body is a hydrated body! 2. Want to lose weight? Drink more water. Often times, we mistake being hungry… for being thirsty. When hunger strikes… grab some water! 3. Flush out that bacteria! Bacteria and waste is flushed out of our body through urine and sweat. If we’re not drinking enough water… we inhibit those functions. Ew. Moral of the story? Drink more water and pee freely. 4. Have a headache? You’re most likely dehydrated. Get rid of it by… you guessed it… drinking more water! 5. Give your skin a healthy glow! Drinking plenty of water will improve the appearance of your skin, by allowing it to produce new cells properly! I’ve read that ultimately… we should be drinking half our body weight in water. So if you weigh 160 pounds… you need to be drinking 80 ounces of water at a minimum each day. Carry water with you. Everywhere. Just keep drinking! You can also get water from raw fruits and vegetables… so eat up! Don’t like plain water? Jazz it up with fruit or sugar free mixes!